Wait, when can you access the friend safari? I've found something about Kiloude City but I'm not quite sure when that is in the game. Yep, even the ones who don't have XY! And kiloude IS postgame. It's a lot of the post game. d_what wrote: Yep, even the ones who don't have XY! i have 45 friends. i am hype. That's funny, my tablet arrived only yesterday! But I don't have my pen/cable/laptop with me so I dunno if my pressure sensitivity even works. By the by, Ninten, if there was a button, big and red, marked 'end of the world switch, do not press', you'd totally press it right? Though I could give Sandile, so I guess there's that. Location : Guys just so you know I am basically NEVER on here. I only really go on the Skype now. I am Jack if that helps. Yeah, I'm Jocelyn. Thought it might be easier if my in-game name was Octi so that's always there too! Jack. Okay. I think I am getting to grips with this. d_what wrote: CC you are Proby, but you are also (I KNEW THAT'S WHAT THE SPELLING WAS) right? Also I want Dregs to come online, (s)he has Wartortle in their friend safari and I really want one to complete my Kanto starter trio. In other news I have all the Mega Stones bar the Y exclusives and Mewtwo now. Oh and btw I am the one whose icon is now Siebold on the Friends bar (once we have been online at the same time the icon shows up on the bar). Because Siebold is so cool. Sorry for doublepost but I needed to say this separately. ROZEWOLF'S THIRD POKEMON IS QUILLADIN! Ivysaur AND Quilladin? You really do have a brilliant Safari. Overgrow Pansage would also be welcome if I could find one. Awesome! :3 Ohh Captain you're steel with Mawile, Klang and Excadrills! Double ninja post actually; I mentioned the quilladin a while ago but yes, I've stocked up on a few already! And CC yours isn't bad either. Clear Body Klang is better than the alternatives and Mawile and Excadrill appreciate the 2 IVs considering their great usage. Someone else on my list has Wartortles. Two, actually. I've already got a rain dish one now... Which to be honest will see very, very limited use but its one single use scenario is way more likely and helpful than the Torrent equivalent. My safari zone is Psychic-type and has Wobbuffet, Abra, and Xatu when I'm online. bloodyEmissary wrote: My safari zone is Psychic-type and has Wobbuffet, Abra, and Xatu when I'm online. If we're ever online at the same time I will love you forever. I've been looking all over for Magic Guard Abra! 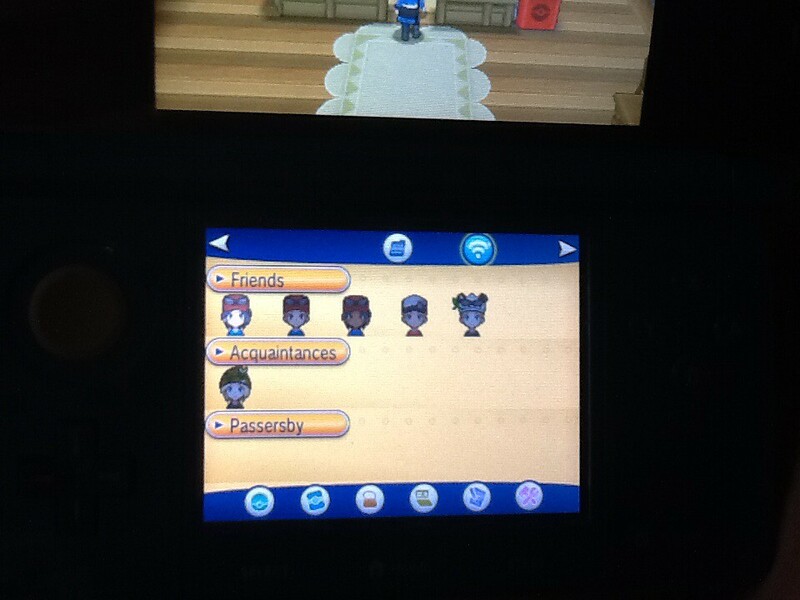 ...This is a picture of my PSS, no one I registered by internet shows up on it. 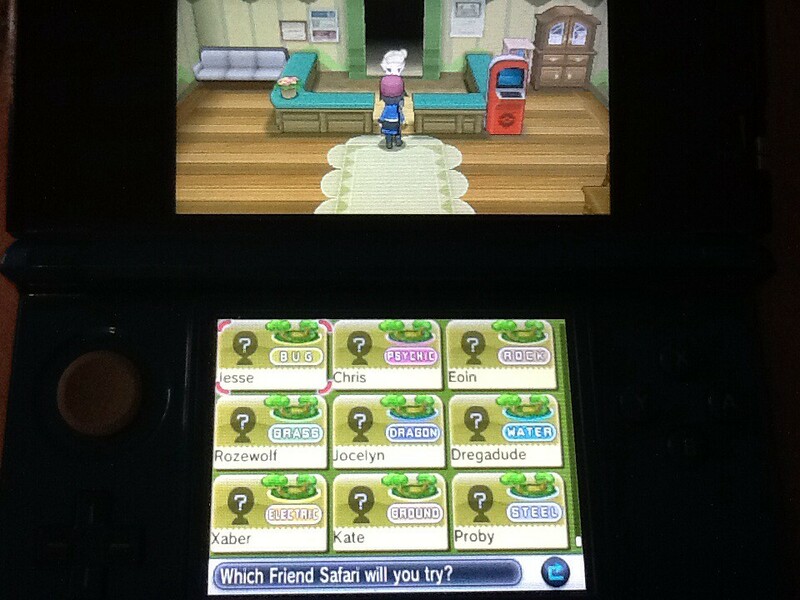 And this is the Friend Safari. You guys are all faceless question marks, even when you're online. D_what was on when I took these pictures, and I wasn't able to access the third pokemon. Anyone have any clue what's going on? I don't know what's up with the faces, but the reason people don't show up on your PSS is probably because you aren't online at the same time, maybe? Though considering your Passerby list is empty (mine is always full)... I dunno. I'm still waiting for you and for like 10 other people to show up as well. But the offlineness keeps happening. I try to come online when I can, but then I keep forgetting and closing the lid of my 3DS and disconnecting. Sorry if that happens. I fixed it! D_what, your third pokemon is Shuckle. Oh? How'd you fix it? Because I've been having the same problem with *a few* people. I'd like to know how to get them to show up properly! Press the little blue wifi button and turn on the internet. Apologies for the sudden battle, I didn't realise you only had four pokemon on you. Sure I only used 3 anyway ;D how cool is Protean? But don't you have to press the blue button anyway? That's for internet and Xaber, Dregadude and a few others still haven't shown up yet even though I know they've got X and Y. Unless this is on their end and THRY have to press the blue button?